Location in Franklin County and the state of Texas. Mount Vernon is a town in Franklin County, Texas, United States. It is the Franklin County seat, and the population was 2,662 at the 2010 census, up from 2,286 at the 2000 census. Mount Vernon started as a settlement near the Fanning Springs (on Holbrook Street south of the present town square). Affidavits filed to establish land titles soon after the Texas Revolution document the settlement by squatters in Spanish Texas commencing in 1818. By 1848 the United States government established a post office, and in 1849 a formal town site was laid out on land donated by Stephen and Rebecca Keith for the town of Mount Vernon. Since there were two other Mount Vernons in Texas, the post office was called "Keith" and then "Lone Star" before the name "Mount Vernon" became available in 1875. Franklin County was carved out of Titus County in 1875, and Mount Vernon was elected county seat in competition with other communities. The county's economy was based in agriculture with corn and cotton, followed by over 500,000 peach trees in production in the 1920s, watermelons in the 1930s, and the state's top record production of cane syrup in the 1940s. The 1936 discovery of oil on C.G. Hughes' land in the north part of the county led to a more diversified economy, with oil production continuing today combined with light industry, manufacturing, and diverse agricultural endeavors. Mount Vernon, as county seat, was assured a continuing vital existence as the economic center for the county. The town boasted churches, doctors, lawyers, and many varied stores in a time before people had the ability to travel far. The town voted to incorporate in 1910 under a mayor/council form of government. In 1911 a bond issue was passed to create a public waterworks. Electric and gas utility service followed. The downtown area reflects a small-town atmosphere. The central plaza has a picturesque gazebo and park benches. On the north side of the square is a classical revival 1912 white limestone courthouse with a chiming clock tower. The courthouse recently underwent an extensive restoration as part of the Texas Historic Courthouse Preservation Program and has been returned to its 1912 grandeur. History abounds in and around Mount Vernon. Over 50 homes built before World War I still stand around town and are marked with signs designating the original owners and year of construction. Tour maps are available at various locations including the Franklin County Historical Association Museums, Franklin County Chamber of Commerce, and Mount Vernon City Hall. There are over 20 official state historical markers in Franklin County. The Cherokee Trace runs along the eastern edge of the county south toward Nacogdoches. The Choctaw Trail runs through the county toward Dallas. The Bankhead Highway remains as Mount Vernon's Main Street. Fire Station Museum – Housed in the 1940 WPA-financed fire station, changing exhibits from the permanent collection include nature and history displays of butterflies, bird eggs, violins, toys, seashells, antique tools, wood carvings, and Native American artifacts. The dental chair and equipment that were once used by Dr. Con Smith in Mount Vernon is on display. Exhibits upstairs include a collection of bird eggs and Native American artifacts from Franklin County and other parts of Texas and a collection of butterflies. The museum is one of only 13 museums holding eggs of the extinct Carolina parakeet, heath hen, and passenger pigeon. An exhibit of sports memorabilia related to the life and career of home-town boy and pro-football legend Don Meredith is also housed here. The museum is open Thursday through Saturday, 10 A.M. to 2 P.M., and otherwise by appointment. It is located at 111 S. Kaufman Street. Call 903-537-4760 for information and appointments for tours or visit FCHA Online. Admission is free. Ask for a free map of historic homes and an annotated driving-tour guide for the town. Bankhead Highway Visitor Center – The Bankhead Highway, which opened in 1919 and ran from Washington D.C. to San Diego, was the nation’s first all-weather transcontinental highway. It passes through Franklin County and serves as Mount Vernon's Main Street and follows an early Indian trading route known as the Choctaw Trail. By 1930 it was renumbered as U. S. No. 1 and was called "The Broadway of America." The Bankhead Highway Route was changed in 1937 and follows present U. S. Hwy 67. The Visitor Center is one fourth mile west of U.S. Highway 37 on CR NW 1017. Just follow Main Street to the west past Highway 37. The Visitor Center includes the Lowry Pavilion, which is available to rent for special outdoor occasions, and the Dupree Park Nature Preserve and Nature Trail, a mile and a half walk through the property with special marked stations for bird sightings. Though the property gates are locked at off hours, a pedestrian gate allows admittance for individual use from dawn until dusk. A printed trail guide is available in the Visitor Center. Alamo Mission Museum – Using a replica of the Alamo Mission as the backdrop, the mission mixes history and fun. Learn about Texas history and bring the family out for family events such as Chili Cook-off & Bluegrass Festival, Turtle Derby, Halloween Hayrides with pumpkin fun, and Redneck Rendezvous. The museum is located at 1714 County Road 4105 SE. For more information, call 903-588-2442. Old Mount Vernon Waterworks Plant – Located on Holbrook Street just south of the intersection with Rutherford Street, the first facility was built in 1911. Dr. Will Godwin, entomologist with Stephen F. Austin State University, and Steve Moore, current Michener Fellow with the University of Texas, are restoring the facility. Franklin County Arts Alliance – The Arts Alliance operates the Old Jail Art Museum (immediately behind the courthouse on town square) and the Cultural Arts Center (at the corner of Rusk and Dallas Streets, one block west of the town square). The Old Jail Art Museum has changing visual art exhibitions as well as a permanent collection on display on the upper floor of the former 1912 county jail that also includes an original cell block of historical interest. Open during community festivities, receptions for the exhibiting artist, and by appointment. The Cultural Arts Center houses the office of the Arts Alliance and is the venue for stage presentations, lessons, meetings, and special gatherings. The Center is open during community festivities and by appointment. For more information, call 903-537-4034. Franklin County Genealogy Society – The Genealogy Society is located in the 1894 Parchman-Meredith Store Building at 110 E. Main (south side of town square) and is open 10 a.m. to 4 p.m. Monday – Friday and 10 a.m. to 2 p.m. Saturday. Free research facilities with local archives and volunteer research assistants are available to both residents and visitors. Other resources include internet subscription to Ancestry.com, microfilm, microfiche and CDs of census and other historic records, and a large collection of books covering the Civil War, Native American History, and UK-Royalty including all states and adjoining counties. Books on local history and vital records are also for sale. For more information, call 903-537-3931 or visit The Genealogy Society website. Mount Vernon Music – Mount Vernon Music offers concerts of traditional chamber music, jazz and other styles as well as educational and family concerts, traveling programs, and interaction of performing and the visual arts. It is located at 402 Leftwich Street. For more information, call 903-563-3780 or visit the Mount Vernon Music website. Franklin County Library – The need for a community library was first brought forth by the Mount Vernon Key Club, a local women’s group, in January 1977. In March, community volunteers manned an office space provided by First National Bank (now serving as office for the Franklin County Chamber of Commerce), and opened the library for donations including books, furniture, and cash. An initial $5,192 was raised to establish the library as a member of the Northeast Texas Library System. Also needed was 3,500 books (donated or purchased) within a three-year period. By the close of 1977 the Key Club reported the library had received cash donations of $25,000 and had exceeded the three-year goal for accumulation of books. The library opened to check out books and serve the public with a full-time librarian on April 1, 1977. In December 1977, the First National Bank deeded the historic 1912 bank building to the county for use as the library. In January 1979 the library opened the downstairs of its current location and in 1980 the library expanded to the second floor. There have been several renovations made throughout the years, the latest in 1997. Now, the beautifully restored building blends its unique history with a full-service modern library. The ornate handcrafted ceiling, marble counters and original vault doors add to the beauty of this historic building. Franklin County Library is a must see when touring downtown Mount Vernon. The library is located at the corner of Main and Kaufman Streets. For more information, visit the Franklin County Library website. Little Creek Park – Mr. & Mrs. N. E. Dupree donated approximately 4.2 acres of land to the City of Mount Vernon in July 1958 for the love and respect they had for the young people of the town and surrounding communities for the creation of a park. The park consists of tennis courts, basketball courts, 2 playground areas, baseball field, a covered pavilion for family and social gatherings, and a walking trail. The park is located just south of the town square on Kaufman Street. Contact the City of Mount Vernon at 903-537-2252 for more information. Lake Cypress Springs – Franklin County is the home of spring-fed Lake Cypress Springs and is a bass fisherman's paradise. It is surrounded by 869 acres of public parks owned and maintained by the Franklin County Water District. Camper sites, shelters, and meeting pavilions are located in various parks at the lake, as well as a marina with water playground equipment. Lake Cypress Springs was impounded in 1970 with 3,400 acres of top fishing waters. Walleye were stocked in the early days of the lake with some success. Black Bass and catfish are the prime targets of visiting anglers today. The waters of Lake Bob Sandlin back up to the dam on Cypress Creek. For more information, contact Franklin County Water District at 903-537-4536 or FCWD Website. Mount Vernon is located at the center of Franklin County at 33°10′55″N 95°13′27″W﻿ / ﻿33.18194°N 95.22417°W﻿ / 33.18194; -95.22417 (33.181890, −95.224147). U.S. Route 67 passes through the north side of town as Main Street, leading east 16 miles (26 km) to Mount Pleasant and west 23 miles (37 km) to Sulphur Springs. Texas State Highway 37 passes through the west side of town, leading north 20 miles (32 km) to Bogata and south 17 miles (27 km) to Winnsboro. Interstate 30 passes through the southern end of town, with access from Exit 146 (Highway 37) and Exit 147. I-30 leads east 78 miles (126 km) to Texarkana and west 101 miles (163 km) to Dallas. According to the United States Census Bureau, Mount Vernon has a total area of 3.69 square miles (9.55 km2), of which 3.67 square miles (9.51 km2) is land and 0.02 square miles (0.04 km2), or 0.38%, is water. As of the census of 2000, there were 2,286 people, 903 households, and 582 families residing in the town. The population density was 618.7 people per square mile (239.2/km²). There were 1,045 housing units at an average density of 282.8 per square mile (109.3/km²). The racial makeup of the town was 77.21% White, 13.52% African American, 0.61% Native American, 0.31% Asian, 7.17% from other races, and 1.18% from two or more races. Hispanic or Latino of any race were 10.80% of the population. There were 903 households out of which 34.7% had children under the age of 18 living with them, 48.0% were married couples living together, 14.0% had a female householder with no husband present, and 35.5% were non-families. 32.8% of all households were made up of individuals and 18.7% had someone living alone who was 65 years of age or older. The average household size was 2.41 and the average family size was 3.08. In the town, the population was spread out with 27.0% under the age of 18, 8.9% from 18 to 24, 27.0% from 25 to 44, 18.3% from 45 to 64, and 18.8% who were 65 years of age or older. The median age was 36 years. For every 100 females, there were 87.1 males. For every 100 females age 18 and over, there were 81.8 males. The median income for a household in the town was $28,824, and the median income for a family was $36,150. Males had a median income of $30,132 versus $18,707 for females. The per capita income for the town was $16,186. About 14.9% of families and 17.8% of the population were below the poverty line, including 22.6% of those under age 18 and 16.3% of those age 65 or over. The town is served by the Mount Vernon Independent School District and is home to the Mount Vernon High School Tigers. The late Don Meredith, former Dallas Cowboys quarterback and Monday Night Football broadcaster, is a Mount Vernon native. Also hailing from Mt. Vernon is 13-year veteran AFL/NFL offensive lineman Bobby Maples. Maples played for the Houston Oilers, Pittsburgh Steelers and Denver Broncos. Although not a native, retired NBA player Greg Ostertag currently resides on a small farm in Mount Vernon and owns several businesses on the historic plaza. 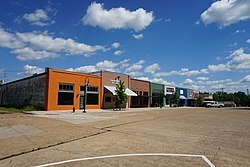 ^ a b "Geographic Identifiers: 2010 Demographic Profile Data (G001): Mount Vernon town, Texas". U.S. Census Bureau, American Factfinder. Retrieved September 2, 2016. This page was last edited on 12 May 2018, at 03:07 (UTC).